This is the story of a tree. Trees shade and beautify our streets and homes and provide timber for building a million useful things. Until the middle of the 19th century, when iron hulled vessels became common, shipbuilders were among the top consumers of wood. A ship like Constitution required about 1,500 mature trees to build, and thousands more to maintain for so many years. Even in America, with its vast tracts of timber, shipwrights frequently had difficulty sourcing timber near navigable waterways. In a nation of farmers, most land near settled areas had been cleared for generations. While so many of its cousins fell to the woodsmen’s axes over the years, one towering white oak in Dedham, Massachusetts, lived to the see the changes brought by four centuries. The oak was a mature tree when English colonists incorporated Dedham in 1636. When William Avery constructed his sturdy timber-frame house sometime after 1650, the tree’s spreading branches lent a veil of shade to his barnyard. 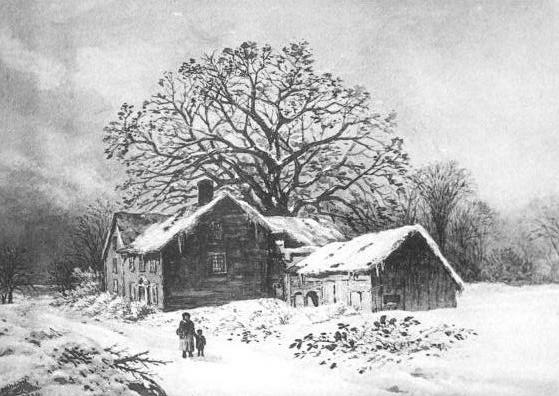 In the terrible winter of 1723, when the snow lay so thick over the landscape that the residents could not access their woodlot, another Avery chopped off the top of the tree to keep his family from freezing. This 1884 watercolor by Henry Hitchings shows the Avery Oak and old Avery house as it appeared in 1853. It was reproduced in the Dedham Historical Register in January 1898.
hull planking. Timber merchants from New Jersey to Maine scrambled to find old growth trees that had the straight trunks to cut long runs of plank, but also crooks and bends that could supply the hundreds of hanging, standing, and lodging knees needed to support deck beams. her. It seems his young family resided in the town during at least some of the period in which the ship rose from the stocks at Edmund Hartt’s Boston shipyard. Capt. Nicholson must have eyed the massive Avery Oak every time he came to town. At last, he approached Jonathan Avery and made an offer. For $70, axemen would come and fell the tree and haul its trunk and limbs to Boston. For a New England farmer, it was a tidy sum. To put the offer in perspective, the able seamen who first manned the ship in 1798 made only $17 per month. Despite the potential windfall, Mr. Avery would not sell it. As legend has it, Mrs. Avery adamantly refused to see the tree go and convinced her husband it had to stay. What was it about that tree that put it beyond the reach of mere dollars and cents? Could it be that the roots of the tree and the Avery family roots were inseparably intertwined? The old tree, spared the axe and ocean tempests, long outlived all the actors in this story. alive. In the Hurricane of 1938, part of it blew down. Finally, in July 1973 a fierce thunderstorm rolled across the south shore. Amid high winds and flashes of lightning, the venerable oak toppled to the ground. 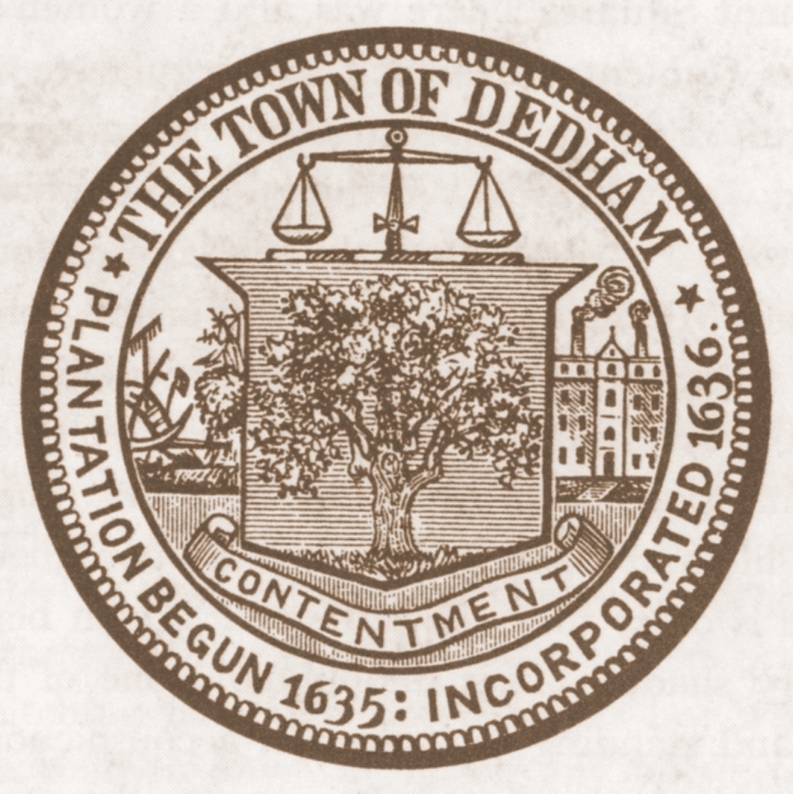 Dedham’s town seal features the Avery Oak in full leaf. Though gone for 40 years, the Avery Oak lives on in Dedham’s town seal, an unrivaled symbol of strength and longevity. April 26 is National Arbor Day, so plant a tree. Who knows what story it might tell a few centuries hence.